With summer behind us, now is the best time to jump in the car and hit the road for an epic weekend road trip. You might not be able to jet away to distant lands, but exploring an undiscovered part of your own country can be a fun way to while away the weekend. Taking your dog along for the ride can be great fun, but there are a few things you need to consider before hitting the road. What will be least stressful for your dog? Some dogs will suffer from awful separation anxiety, so even going away for a weekend and leaving them with a reliable pet sitter or family member will make them very stressed. On the other hand, some dogs don’t respond well to travelling, so taking them on a road trip can be quite stressful. Decide what will be least stressful for your dog before making any big decisions about taking your dog with you. Don’t forget that your dog also needs to belt up, for your safety and for theirs. Your dog needs to be able to move around enough to get comfortable, but not enough that they can climb into the front seat. Make sure your dog is wearing a harness instead of a collar for extra comfort and create a dedicated space on the back seat to keep them comfortable throughout the journey. Dogs can get motion sickness too! If you’re familiar with the car sickness, you’ll know how terrible it feels. And you might also be surprised to know your dog can get sick too. Your vet may be able to prescribe some specialist motion sickness pills or a mild sedative to help your pooch snooze through the journey. It’s important not to give your dog a motion sickness pill intended for humans, and you should always test the dosage on a shorter journey to help you and your dog get used to it. Dogs are notorious for poking their noses it places it shouldn’t be, and this is particularly difficult when you’re in a new and unfamiliar place. If you are walking your dog in a woodland area, keep him on an extendable lead so you can be ready to help him out if he has a run in with the local wildlife. Try not to let him eat unfamiliar berries or drink from standing water, and keep him away from grassy areas where snakes may be lurking! 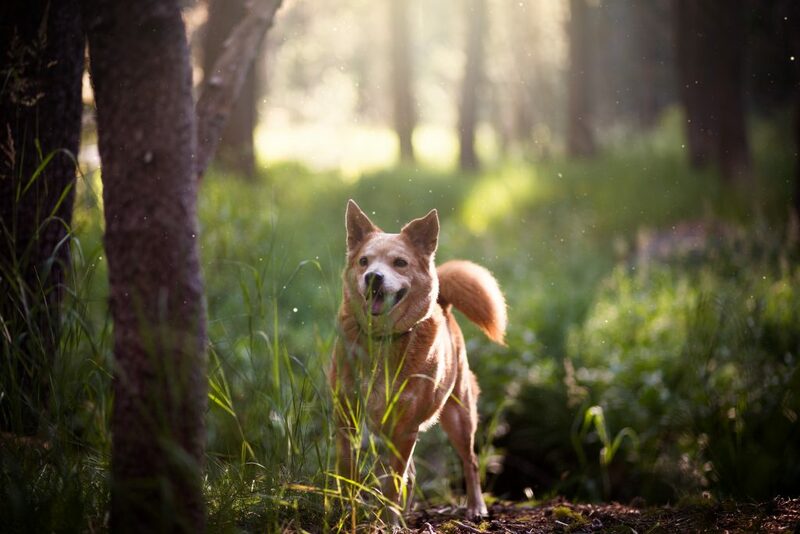 To give you peace of mind when he is off the lead, make sure he is microchipped and that his dog microchip number is registered with a few different microchip registries. This will give you the best chance of being reunited if he darts. Your dog has luggage, too! If you’re staying overnight, make sure you bring plenty of food, a familiar blanket and some toys to keep him occupied. Other useful essentials include dog shampoo, a tick remover, plenty of poop scoop bags, a spare collar and lead, first aid kit, a travelling water bowl, and plenty of treats.